Thank you for visiting Open Bible Baptist Church’s website. Please take the time to look around and get to know us better. My name is Brad Logic, I am the Pastor here at Open Bible and would like to take a moment to tell you about myself so that you may better know me. I was born in Pottstown, Pa., in June of 1976. I was not raised in a Christian home, as a matter of fact, it was far from having the appearance of any kind of religion. Quite honestly, I was not interested in knowing anything about God and perfectly content with just knowing there was a God that sat supremely over all and He was in charge over the affairs of men. Oh, I heard that Jesus Christ came into the world to save sinners and I even believed He did do that. But that was as far as my understanding went and I was fine with that. I even sat through the public-school system teaching me that I was a product of evolution, yet all the while I fully rejected such a foolish notion. In my mind, there was just no way that a sincere, thinking individual could consider such a thing. I knew there was a Creator, I knew there was a Saviour, I just did not know Him. My life continued on as it does for most, and I became very career oriented. I got married to a wonderful woman, better than I deserve, and after 2-1/2 years we had our first child, a baby girl. I became, at this point, more career oriented than I ever was before. I wanted to provide the “best” for my family. I focused on making something of myself, unfortunately, at the expense of not being there for my family. After another 5-1/2 years my wife and I had our second child, another baby girl. Soon after, almost 1-1/2 years after our second child, our third baby girl was born. At this point, I had become so engrossed with the idea that my family deserved the “best” and I was determined to provide that for them. I soon found myself spending more of my time focusing on career and not on them. It was no longer about my family, it was about me and how far I could go, what I could make of myself. This was also a time in my life that, although having a great job, a wonderful wife, three terrific daughters, the house, the new cars, the motorcycles and everything else that “satisfies,” I was the emptiest I had ever been in my life. I eventually realized that nothing ever satisfied and that I was continually trying to drown that emptiness with more stuff, more money, and more toys. The bottom line was that no matter how hard I tried, nothing and no one could fill this hollow shell of a person. Nothing! It was at this point, I started asking myself, “why are you even here, why do you even exist, what is the purpose of all this?” Now remember, I was not raised in a Christian home, but I did have a respect for the things of God and the Bible. Truthfully, of all the “religions” I had come across, only that which was based upon the Bible made any sense to me. So naturally, that is where I went to find the answers to my questions. I knew God had all the answers, so it was to the Bible I turned. As I read, my lifestyle and my sin started bearing down on me as an indescribable load. Looking back now, I realize how good the Lord truly is, because at this exact time in my life there was a man that visited the shop that I worked at. There was something about him that was obviously different than anyone I had come across before. The men in the shop that knew him said he was a Christian, but that I should stay away from him because he was a “fanatic.” I knew though, that this man probably had the answers I was looking for and because he knew the Bible, he could help me clear up what I had been struggling with. I started asking him questions, but because of my pride, I would ask in such a sarcastic manner so as to not let him, or anyone else around me for that matter, really know I was seeking answers and that I was seeking the truth. But thanks be to God, this man saw right through it all and patiently continued to answer my questions. After a period of approximately two months of this man spending time with me to early hours of the morning, I realized that my sin was against God and that I rightfully deserved punishment, hell, and ultimately an eternal lake of fire. I knew I was a sinner before, but now I saw that God is holy and just, and must punish sin. To this day, I still remember the day and the very place I was standing at that man’s shop when I realized my sin was against God! I knew the only way I could be made right again with such a holy God was through His love and grace He was extending to me through His Son, the Lord Jesus Christ. It all came together! It solidified in my mind and heart! I got saved, born again, washed in the precious blood of the Lamb on April 22, 2007. I am very thankful the Lord used Steve Czarnecki and grateful He sent a man across my path who would patiently deal with me. Never give up on those the Lord lays on your heart! I give all the glory to the Lord Jesus Christ for the salvation and reconciliation that is offered through the finished work on the cross! Since that day, the Lord has graciously and mercifully helped me to grow. He moved us to South Carolina in 2011 and put us under our Pastor, Jonathan Doss. Pastor Doss was greatly used by the Lord, helping us grow and become balanced Christians. Brother Doss put the emphasis on God making and molding the man and not merely on external conformance, or how others thought things should be done. He faithfully puts forward the word of God, the principles and the application for Believers, but allows them to grow and God to work in their lives. God greatly used all the brethren at King James Bible Baptist Church to prepare me for what He desired in my life. I became involved in a Truckstop ministry and a Juvenile Center ministry, just faithfully being there praying for those men as they preached the word of God. After two years of this, the Lord started opening doors for me to preach in the juvenile centers and another door soon opened in one of the prisons. It wasn’t long before I found myself not only in the juvenile centers and the one prison, but also in another prison and the local jail both as a volunteer chaplain! I started working part time so that I could keep up with all the opportunities the Lord provided! Before I knew it, I was full time and fully supported! Every situation I found myself in, the Lord opened the door and I just stepped through. I did not try to push my way in, I just let the Lord work in my life. I was supported full time and active in this ministry of juvenile centers, jails, and prisons for over 4 years. Although I was quite content doing what the Lord currently had me doing, I believed the Lord would have me to pastor. I spoke with my Pastor and just continued in prayer. I saw how the Lord did things before, so I was set on waiting until He opened a door. I know His timing is always right on and He would direct me to the place He would have me to be. After almost 9 months of waiting and praying, my Pastor told me he was contacted by a church in Brunswick, Ga. that was seeking a pastor because their current Pastor was following the Lord’s leading to be a missionary in Papua New Guinea. The church in Brunswick and I agreed to meet and allow me to candidate as their next pastor. After a month of much prayer and seeking the Lord’s will for Open Bible Baptist Church, they invited me to pastor the church which I gladly accepted. I count it a great privilege and honour to be the Pastor here at Open Bible to a group of Saints that love the Lord and His word. Although the Lord has used many folks through the years to help me, I give thanks to the Lord for His guidance and help. What a wonderful God we serve! It is my desire, my vision, to see souls saved, get in a good bible-believing church, and fall in love with the Lord Jesus Christ and the word of God. By God’s grace this will be the vision of Open Bible Baptist Church until the Lord calls us home. 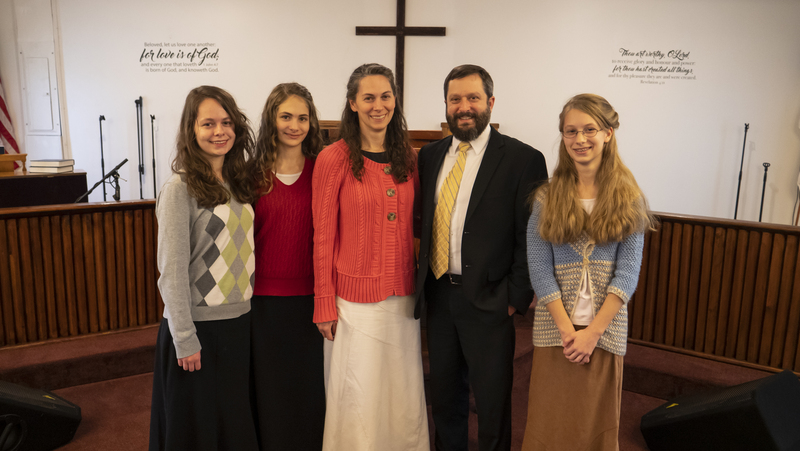 Please, if you are looking for a church where the Bible is taught and preached, a church where the Saints love the Lord, and a place where you are like family, stop in at Open Bible Baptist Church. We would love to meet you!